After a career spent training and competing through the pain, the former Dallas Cowboys quarterback got to the core of the problem. This article appears in the wall street journal. Click here for its full print version. When Troy Aikman retired from the National Football League after 12 seasons as the Dallas Cowboys’ quarterback, he was determined to keep training as hard as ever, out of fear he’d become an “overweight retired guy,” he says. Mr. Aikman, the NFL’s No. 1 overall draft pick in 1989 and a Pro Football Hall of Famer, led the Cowboys to three Super Bowl titles. Back pain eventually ended his career in 2001. “I’ve never not worked out,” says Mr. Aikman, now a television commentator and lead analyst for NFL on Fox. Because his initial back injury occurred while he was doing squats, Mr. Aikman had always concentrated on running, lifting light weights twice a week and avoiding intense lower-body exercises. For the past decade, he has worked with Dallas-based personal trainer Jason Harnden. 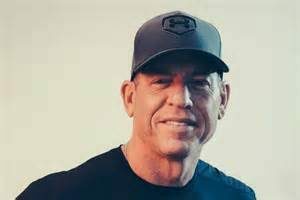 Now, Mr. Aikman, who turns 50 on Nov. 21, says he is in the shape of his life—and pain-free. Now, he incorporates spinning and stretching and does smarter strength work. He takes Sundays off during the NFL season. “Instead of going to the gym in the morning, I go to the stadium and enjoy the energy of game day,” he says. Mr. Aikman does four one-hour strength workouts a week: one for muscles in the front of the body, one for the back, one for core and one full-body. On a core day, he’ll do crunches on a stability ball while holding a 45-pound weighted plate, and kneel on top of a stability ball and rotate his core while holding a medicine ball and maintaining his balance. He’ll lie face down across a stability ball, hands to the floor, and lift his legs into the air to work on hip extension. To work his core and back, he’ll do pushup-to-plank rows. He does 45 to 60 minutes of cardio five or six days a week. He mixes up 6- or 8-mile runs with interval work on the treadmill. In summer, he runs on the Katy Trail in Dallas. “The hotter the better,” Mr. Aikman says. His oldest daughter, Jordan, 15, sometimes joins him for spin class at Flywheel. He tries to stretch his hips and hamstrings for 10 minutes when he wakes up and before bed. For breakfast, Mr. Aikman eats egg whites or makes oatmeal pancakes with bananas, honey and pecans. If he’s on the road, he might grab a smoothie. Lunch or dinner might be grilled chicken or salmon and steamed broccoli. “I’m a pretty boring eater,” he confesses. A 20-class pack at Flywheel costs $420. He wears Under Armour athletic apparel and sneakers. His Fitbit Surge retails for $249.95. Bruce Springsteen, John Mellencamp, Bob Dylan and Van Morrison are on Mr. Aikman’s playlist. He often uses Pandora when he works out. If he’s on the treadmill, he might watch the news or ESPN.